The single malt, which is dominated by maritime influences, was launched at the Campbeltown Whisky Festival on Wednesday 24 May. Founded in 1832, Glen Scotia distillery is one of three surviving distilleries in Campbeltown, which is one of Scotland’s five recognised regions of Scotch whisky production. The Argyll town was known as the “Victorian Whisky Capital of the World” when there were over 30 distilleries operating on the Kintyre Peninsula. Michael Henry, who is Master Blender for Loch Lomond Group, owners of Glen Scotia, explained the unique flavour of this complex single malt. He said: “I created the 25 year old with the history of Campbeltown in mind. For many years, trade has come through this port town bringing fruits and spices from all over the world on its salty sea breezes. I wanted the liquid to reflect this. The 25-year-old is bottled at 48.8% ABV and is non-chill filtered for increased depth of character and flavour. The liquid was matured in the finest American oak barrels, before each cask being hand selected by Michael Henry and then married in first fill bourbon casks for a final 12 months before bottling. Iain McAlister, Glen Scotia distillery manager, said: “We’re extremely proud of our newly released 25 year old malt and we’re confident that everyone who gives it a try is going to love it too. In recent years, our single malts have won some major industry awards and I can see our 25 year old challenging the current leaders for a few more titles. The 25 year old won praise from renowned whisky writer Charles MacLean, who conducted a tasting of the new malt at its launch. 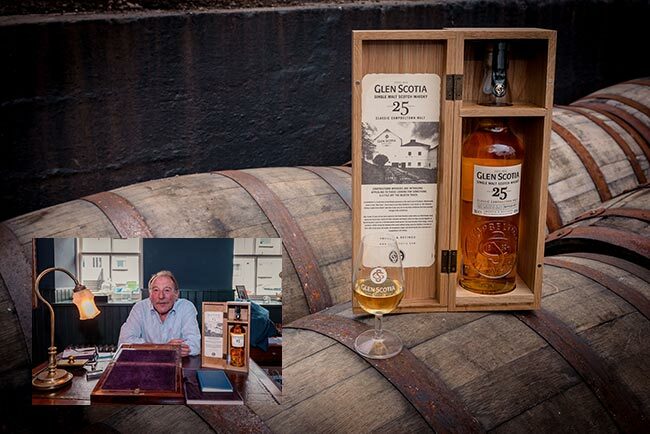 He said: “I’m very impressed by Glen Scotia’s new 25 year old. Even on the nose you can detect the age. The single malt will be stocked in all good whisky shops from June and will retail at £250 for 70cl bottles. The emblematic Glen Scotia bottle is presented in an oak case engraved with the Campbeltown coordinates. Glen Scotia was recently named the Best Campbeltown Distillery of the Year at the 2017 Berlin International Spirits Competition.